#1 Cut down what you pack up. Donate the stuff you can’t sell to secondhand stores and throw the stuff you can’t donate away. Whatever you do, DON’T try to hold onto something in the hopes of selling or donating it at a later date (unless it’s a major antique or valuable family heirloom). #2 Get a good moving service. If you’re moving out of an apartment, you can probably DIY your move. But if you live in a large single-story or multi-level home, you’re better off hiring movers. Hiring movers doesn’t have to entail extravagant costs and extras; in fact, there’s a good chance you can find a local moving company within your budget. Remember, you want to get everything to your new home in one piece — preferably in the least amount of time required. #3 Check the moving quotes. When shopping or comparing local companies, you need to get at least three quotes, just like you would any other local service. You can also negotiate with movers, depending on how close their quotes are in price. This is especially true in the off-season, between fall and winter, when they’re most likely to lower their rates. 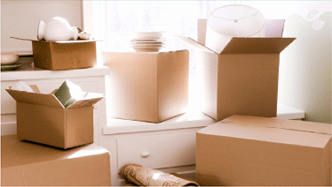 #4 Don’t overspend on packing supplies. Never buy packing supplies from a moving truck rental store. Get boxes from friends and family members if you can. If not, buy boxes from local home improvement stores. Some websites also sell packing supplies at an affordable rate. Moving shouldn’t have to be stressful, expensive and time-consuming. By preparing, finding ways to save money and planning appropriately, you can make a smooth transition from your old to new home while keeping your sanity intact.